IU alumni are impressive for many reasons: their sheer numbers, how you can run into them practically anywhere, their incredible success. The most remarkable thing about IU grads? The way they support IU, students, and each other throughout their lives. 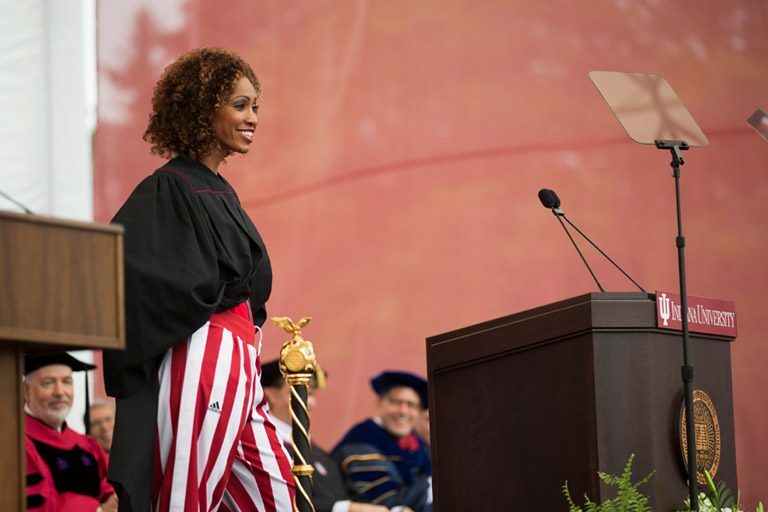 Sage Steele displayed her IU spirit during her 2015 Commencement speech. Your IU network includes . . .
Whatever stage you’re at in your professional life, the IU Alumni Association (IUAA) will help you manage your career. Network with IU alumni and tap into their career wisdom. Seek advice from career coaches. Attend professional development events, in person or online. And that’s just the start of how the IUAA helps students and alumni.